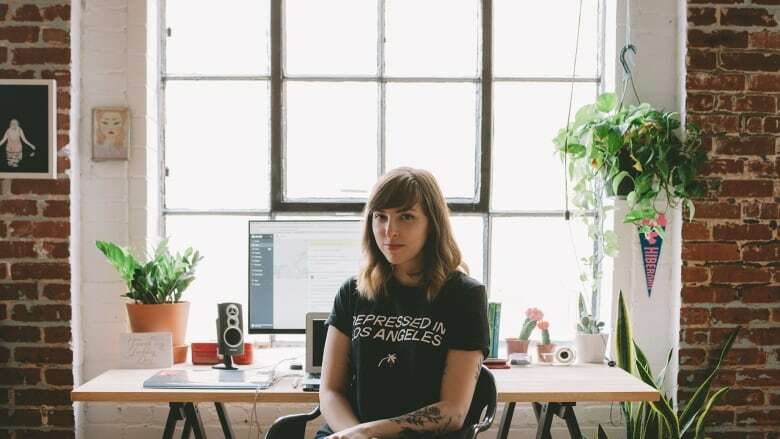 Olivia Mew, president of Montreal-based business Stay Home Club, says the phenomenon of big companies copying independent artists' work is increasingly common. At least once a week, Olivia Mew receives messages from clients around the world alerting her about products that aren't hers, but look very similar. Mew is an independent artist and president of Stay Home Club, a Montreal-based lifestyle brand that sells clothes, jewellery, bags and prints, among other things. She says being ripped off is always a concern in her line of work, but it used to be just smaller companies stealing images and producing them on a relatively small scale. Now, she and her peers are finding bigger companies are getting in on it. She claims one of her designs was knocked off by London-based company River Island. "With the big companies there's that extra sting of knowing that they've probably sold hundreds, thousands of this item and you're not seeing any compensation for it," she said. The images that are ripped off are ones that are popular online. From what Mew's seen, the ones that trend have aesthetic properties or a message that people gravitate to. Some companies will buy wholesale patches from small companies in other countries and don't check to see where those small companies got the designs from. "I'm very angry [big companies] have the gall to do it," Mew said. "They claim it's out of their hands, they bought it from a contractor, they have no idea. It's angering that in a company of that size, with that many resources, they wouldn't have someone Google to find out if it already exists." Ashlee Froese, a Toronto-based fashion and branding lawyer at Fogler Rubinoff, said that if an image is original, a copyright can be obtained in Canada for $50. But establishing originality is the key, she said. Mew posted a photo to Instagram of a patch her company sells beside one London-based River Island sells. Froese says while the patches share similar themes, the issue is whether a patch featuring a common saying and two different jungle cats is original enough. "Does the original piece of work meet the threshold of being original? There's more to looking at it than just putting them side by side," she said. Some so-called fast-fashion companies, where the turnaround from design to product is as quick as possible, might consider it profitable to modify the designs of others just enough to avoid charges of copyright infringement, added Froese. But the bottom line, she said, is that it is possible for designers to protect their creations; business advisors and lawyers well-versed in intellectual property law can help them do that. "There's an onus on designers to understand how intellectual property can help them so they can then protect their greatest asset, which is their creativity," she said. River Island has not responded to CBC's requests for comment. Mew and her peers are using social media to raise awareness about the issue. A fellow designer, Tuesday Bassen, posted the response she got from Spanish-based Zara when she raised concerns about copyright to them. The post has more than 10,000 likes. Stay Home Club is based in Saint-Henri and has four employees, but they licence work from other artists and are diligent about paying them royalties when they do use their work. "It's very frustrating that we follow the rules and they don't," she said.